City planning encompasses a large range of activities undertaken by planners and others to improve the health and environment of our urban areas. 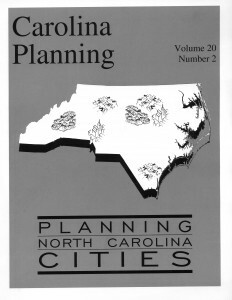 This issue of Carolina Planning highlights a variety of the programs and projects that are underway in North Carolina’s cities. This paper describes investor motivations, obstacles to attracting investment, public development needs, financing tools for rehabilitation, and the benefits of public-private partnerships. A case study exemplifies how housing preservation and neighborhood revitalization can occur with P/P partnerships. This article examines the popularity of homeownership and its desirability as a policy outcome in our society. Ideology and homeownership trends are discussed. North Carolina homeownership and related policies are evaluated, and homeownership efforts in Charlotte & Durham are highlighted. Three case studies of public involvement efforts in Greensboro, North Carolina are presented. The Design process for a highway corridor in Raleigh was presented. Visual Reference Inventories, Design Recommendations, and Implementation Strategies are discussed on the project. This article outlines how a multi-disciplinary team has come together to enhance service delivery in Winston-Salem, North Carolina. This fund’s history, application, matching programs, and success with the Greenville Homeowners Association are presented. This article chronologues Asheville, North Carolina’s effort to turned an industrial riverfront section of the city into a revitalized area. This article outlines a recent study that attempted to illustrate the likely future impacts of city and county government consolidation in three areas: fiscal efficiency, local government service delivery, and economic development in Durham, North Carolina.